The holidays are in full swing over here, as this is my ever-fave time of the year. One of my favorite holiday flavors is Eggnog. The thing is…I’m not so much into drinking it. In a latte? Totally. In ice cream, hell-to-the-yes. Cookie, cakes, etc…yup. Even though eggnog is basically melted ice cream–drinking it is just too much for me. The viscosity gets to me every time. I love to add eggnog to a baked good–like these super soft cookies or this pretty cake. It replaces the dairy in many recipes like a dream. The richness and subtle nutmeg spice is perfect for holiday baking. 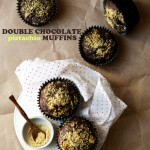 I threw these muffins together, using my favorite recipe as the starting point, over the weekend. 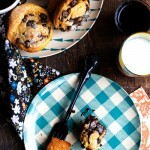 The muffin is tender and fragrant with eggnog flavor. 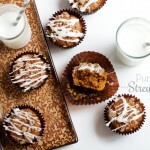 The streusel has hints of nutmeg and the sugary crunch is perfection in top of the tender muffin. They come together quickly and are perfect with a cup of coffee on grey-sky mornings. Makes 8 standard or 24 mini muffins. Preheat oven to 350*f and line your desired muffin tin with paper liners. Set aside. Brown the butter for the muffins and streusel. Melt 5 Tablespoons of butter in a small pan. Heat over medium until the butter becomes foamy, continue heating–swirling or stirring the butter–until the milk solids become dark golden brown and fragrantly nutty. Remove from heat and divide accordingly into two bowls. Set aside to cool. In a small bowl mix the streusel together by combining the 2 Tablespoons of browned butter with the flour, sugar, nutmeg, and salt. Set in refrigerator until ready to use. In a mixing bowl whisk together the flour, sugar, salt, baking powder, baking soda, and nutmeg. In a large measuring cup whisk together the egg, eggnog, 3 Tablespoons of the cooled browned butter, and vanilla. Add the wet mixture to the dry and fold until just combined. Divide the batter evenly among muffin cups, divide streusel evenly over the tops of each muffin and bake in the center of the oven until a toothpick inserted in the center comes out clean–about 13-15 minutes for minis and 16-20 for standard muffins. I would check them both after the earliest suggested time and go from there. Remove from oven and cool completely on a wire rack. Can be stored in an airtight container for 3-4 days. Egg nog AND browned butter? Oh. Ma. Gah. I can’t handle it. 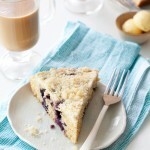 Love the streusel topping too. 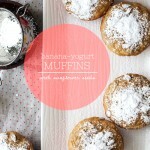 I do like the flavor though, and these muffins look delicious…But I’ve got my eye on those iced eggnog cookies! Yum! These sound so good! and I can’t get over that pompom business. OMG I totally get why How Sweet It Is is crushing on you… you’ve got me drooling as well (in the non creepy way of course). How could I not have seen your blog before?! 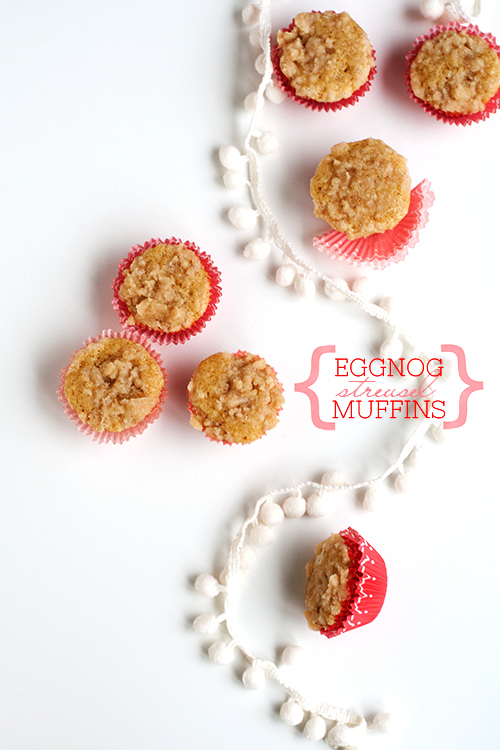 I’ve never had eggnog before but these muffins have me wanting to buy it just to make them. oh, man! you should definitely try it out. Thanks Laura. I kind of love drinking just a (small) glass with lots of bourbon. I like a good 1:1 bourbon and egg nog ratio. And these muffins are so cute. I mean, that first picture? DREAMY! yes! Thanks Adrianna! I am totes going to try that eggnog/bourbon business tonight! i’m not a big fan of eggnog on its own, but i love it in baked goods. these look fantastic! eggnogg to me is a tragic holiday charade (this is my new fave catch phrase that you coined a few posts ago). it looks so creamy and inviting, but then i try it and i’m like – ew. i think i could get on board with it in a muffin formation though! haha! you don’t even know how much this makes my day! Thanks Robyn!!! This is the greatest idea I’ve ever seen. 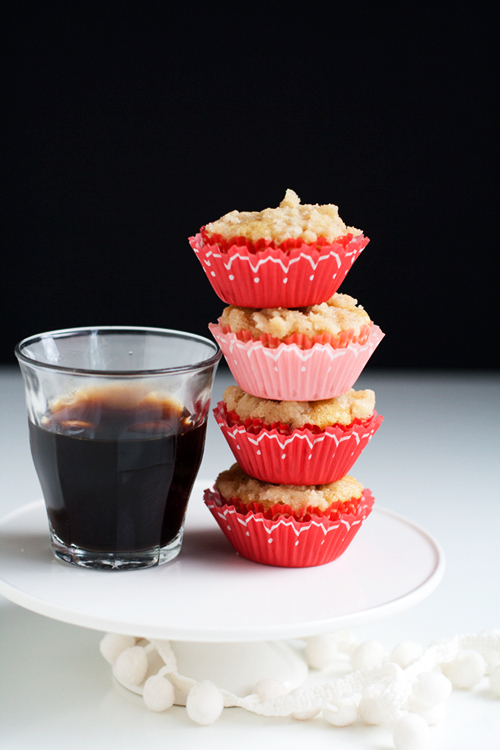 I love the idea of muffins though…especially when topped with streusel. Yum! no shame in that…it’s seasonal, haha! Thanks Morgan! Nice! 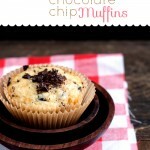 I love the cute muffin wrappers, too! so…slightly odd question. I, too, love the flavor of eggnog, but the consistency is basically retch-tastic. that’s why I’ve gotten hooked on soynog (are you cringing already? ), because it has delicious eggnog flavor, but none of the icky melted ice cream gag-worthiness. my question is, do you think I could replace regular eggnog with soynog in this recipe? I worry it will mess up the chemistry of the muffin. any thoughts? I would go ahead and try it. I’ve never done it myself, but I don’t see why it wouldn’t work. Good Luck! Why oh why did I not buy eggnog at the grocery store tonight? These look awesome! Definitely easier to handle than a glass of eggnog for the eggnog-phobes out there!